Created by accident and sustained by agricultural water privileges, the fate of Salton Sea in California may be sealed by the state's historic drought. If the lake isn’t restored, it could spell ecological disaster for humans and wildlife alike. Created by an accidental Colorado River canal breach in 1905, Salton Sea benefitted the area's rich farming culture, as agriculture in the Imperial Valley long received more water from the river than was proportional. The sea was sustained by (often toxic) farming run-off. The area became a tourist destination in the 1950s and 1960s, yet the situation became increasingly unsustainable. Colorado River dependent states like Nevada and Arizona demanded more share of resources starting in the 1990s. A Quantification Settlement Agreement was signed among several California water agencies regarding allocation of water from the Colorado River in 2003. According to the 2003 deal, farmers in the state's Imperial Valley agreed to halt working on some 50,000 acres and to send that water to San Diego and Coachella Valley residents. The urban areas paid for water conservation efforts in the Imperial Valley, including lining canals and drip irrigation systems. Salton Sea was given 32 billion gallons of water per year pursuant to the agreement since the lake had been sustained through agricultural runoff since it was created by the canal breach. “That’s a lot of water for a lake that not a whole lot of people like,”Michael Cohen, a senior research associate at the water-policy non-profit Pacific Institute,toldThe Washington Post. This spring, California Governor Jerry Brown ordered a 25 percent cut in urban water usage based on ongoing drought conditions across the state. This contributed to the ongoing dispute as to whether large quantities of valuable water should be squandered on the lake. Should the lake be preserved? Since 2003, Imperial Irrigation District has put water directly into the 350-square-mile southern California lake -- the state's largest -- to stem its receding shoreline. This week, Imperial County and the Imperial Irrigation District agreed to settle a 12-year dispute over restoration of Salton Sea. The conflict stems from the 2003 agreement and pledges made by the state and the various entities involved. "This settlement agreement sends a clear message that Imperial Irrigation District and Imperial County are united in our efforts to advocate for a Salton Sea restoration plan," said Antonio Ortega, governmental affairs officer for the Imperial Irrigation District, according to Courthouse News. The 2003 agreement is to end in 2017, leading many to worry about the environmental ramifications of allowing the lake to dry up amid a lack of water resources elsewhere. "The state of California said in the water transfer agreement that they would restore the Salton Sea," Jessica Lovecchio, of the Imperial Irrigation District, recently told KNPR. "To date we haven't seen any progress with that." The state's stalled restoration efforts have frustrated Salton Sea advocates. "We're really pushing for a smaller, but sustainable Salton Sea," Lovecchio, with the Imperial Irrigation District, said. "We still want the Salton Sea here, we just want one that is manageable." Two weeks ago, Gov. Brown proposed a task force focused on expediting conservation of the Salton Sea. "Prior comprehensive plans to restore the sea are no longer feasible due to cost and decreased water availability resulting from the drought in California and in the southwestern states," the governor wrote. Though locals have seen these kind of efforts before. They want concrete solutions from the state. "Too many task forces and not enough action," local assemblyman Eduardo Garcia told the Desert Sun of the proposal. The Salton Sea air basin's poor air quality exceeds the state's standards for wind-borne dust, according to KNPR. Should the lake dry up, high levels of arsenic, selenium, and traces of the long-banned pesticide DDT are lurking dangers. Preventing dust spread would be expensive, yet a recent study by the Pacific Institute found that not addressing the problem would cost nearly $30 billion. "If the sea dies, plumes of poison dust will whisk through the air at the speed of Santa Anas,"wrote Logan Jenkins of the San Diego Union-Tribune. Imperial County already leads California in childhood asthma hospitalizations. "I almost never go" to Salton Sea, nearby resident Maria Gudiño told KNPR. "But when I have gone, I have to cover my nose." Gudiño said she and three of her children have asthma. The lake, at 50 times saltier than the Pacific Ocean based on years of evaporation and stagnation, is home to only a handful of fish species that can survive such conditions. Salton Sea's shores are largely made of dried, ground-up fish bones. 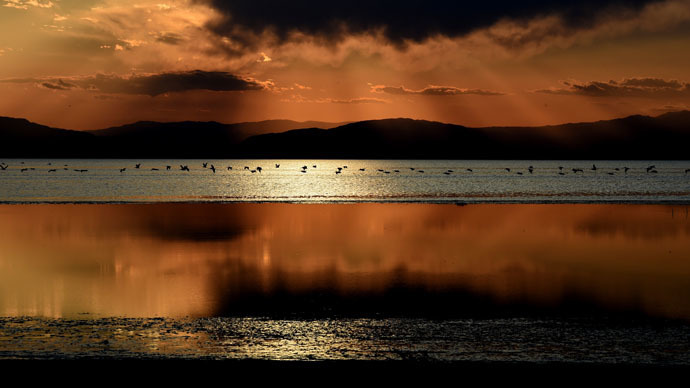 Salton Sea, however, is a haven for birds: More than 400 species make the lake the second-most diverse collection of birds in the United States, according to The Washington Post. If the lake is not restored, experts say the bird populations will disappear.